Fathers Felipe and Paulo Lizama, two twins saved from abortion when it was legal in Chile, are now both Catholic priests. The siblings say their mother’s determination to protect them in her womb fostered their vocations. The twins were born on September 10, 1984. Felipe was born first, and the doctors thought of doing a procedure to remove the placenta, as it wouldn’t come out by itself. But Rosa told them to wait as she felt another child was on the way. Paulo was born 17 minutes later. “They could have seriously injured me, but my mother knew I was there. This means a lot to me,” he said in an interview to ACI Prensa. When they were 14 years old, the twins’ parents divorced. When they turned 18, they decided to attend seminary. 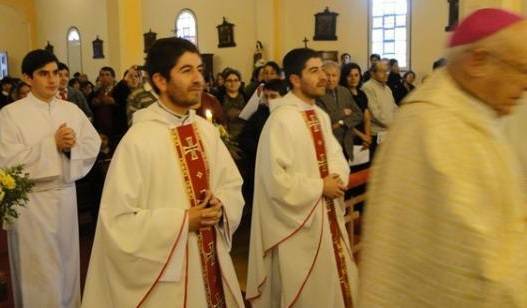 After 10 years of studies, they were ordained priests in April 2012 in the Valparaíso Cathedral, and were assigned different parishes. “God’s calling is mysterious, it’s hidden and it develops throughout your own personal story. It is as mysterious and as personal as each individual,” he adds. Abortion in Chile is illegal without exception since 1989, and the country boasts the lowest maternal mortality rate in all of Latin America. Abortion and Ireland: Are the Irish Copping Out?